If you’re interested in non-surgical fat loss options, you may be wondering which would be better for you: SculpSure™ or CoolSculpting®. Virginia Surgical Arts is proud to offer SculpSure™ treatments and can help to explain why SculpSure™ may be a more effective procedure than CoolSculpting®. To discuss if SculpSure™ is the right procedure for you, please call us today at (757) 430-7690. SculpSure™ and CoolScupting® have many differences, and we can give you Six Reasons why we prefer SculpSure over its competitor. As opposed to CoolScupting® that utilizes cooling technology, SculpSure™ treatments are delivered by a laser system that heats your fat cells. By directing this laser technology into your stubborn, fatty areas, the laser heats and emulsifies the fat cells, essentially melting them. Once the fat cells are melted, they are naturally vacated by your body. 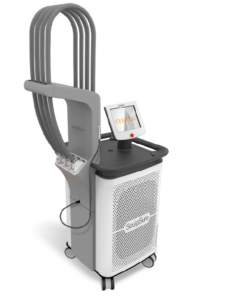 Additionally, the heat from the SculpSure™ treatments encourage collagen and elastin production in your treated areas. This encourages healthy and youthful tissue growth, leaving your treated area not just thinner, but more taut and beautiful as well. To see Frequently Asked Questions (FAQs) about SculpSure, click here. At Virginia Surgical Arts, we do not offer treatments with CoolSculpting®. We want to provide the best-available products and technology to our patients, while saving you money, time, and maximizing your results. Because SculpSure™ requires only one treatment per area and requires half the time as CoolSculpting®, it saves our patients time and makes their fat loss more efficient. This also comes after Dr. Vendetti’s extensive experience working with non-invasive body slimming laser devices and tremendous research to find the most effective yet safe technology for his patients. We hope you will consider SculpSure™ at Virginia Surgical Arts when you have made your decision to pursue non-invasive body slimming treatments that are safe and effective. You can maximize your results, save time, and experience results sooner. Contact us today to discuss your SculpSure™ questions and how it can help you love the way you look! Please fill out the form on this page or call (757) 430-7690.